Windows: Windshield and back glass lower into the body by means of leather straps, and door windows lower by crank, making it a "delightful summer car." Charger: None yet---plan to use modern charger. Update 4/14/2019: Owner discovered Date Stamp "JUNE 1919" on topside of right front spring. This is the first actual dated Milburn factory part identified on one of these cars. Happy Centennial anniversary to this and all the other 1919/1920 Model 27L's! Analysis 1/20/2019: The car was purchased at auction in August 2018 from Gervais Farm in Saskachewan. License plate on car shows "2204 Maine 1915", being a 1915 plate, this is clearly a plate that someone added later and does not necessarily suggest the car was ever owned in Maine. 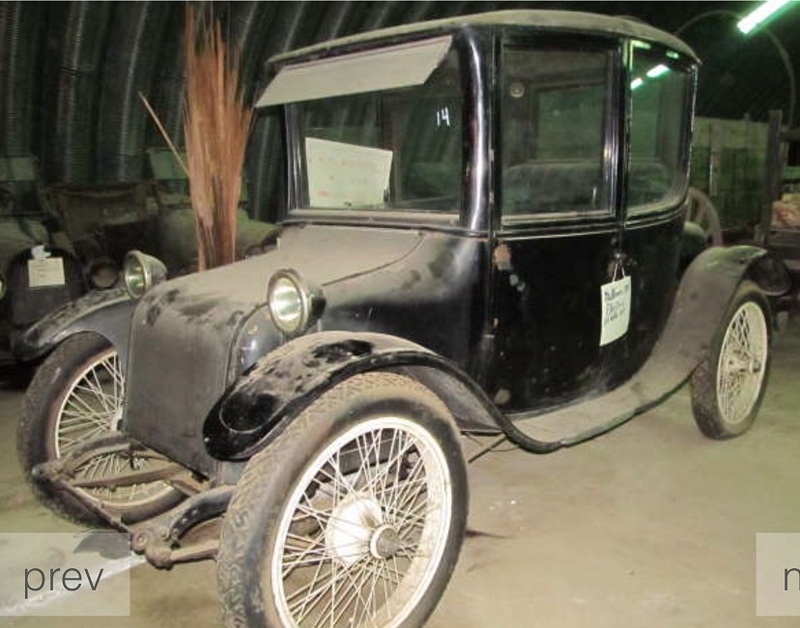 The car S/N 216667 confirms this to be a 1920 Model 27L car. Body#9857 also fits well with this being a 1920 Model 27L. The owner of the car found a note behind the instrument panel in which the former owner noted the car as being owned by Melvin Purvis of South Carolina, the one who captured Dillinger. News article(s) confirm that Purvis did purchase a Milburn in South Carolina. The car's black color and black leatherette interior also fit an FBI agent owning the car. Further, Purvis was very short and this car has extensions on the brake pedals, which fits. The 458XXX motor# is a 1917/1918 model year motor for a Model 27 car. We may never know why it ended up with this motor. Other #s in chalk associated with the Body# are interesting and suggest date and year-prod#. Stamped number found in the body is odd though #749. That is a number which fits in the Model 27 body# range, not a number expected for a Model 27L. The car also appears to have had some sort of bumper up front given the remaining brackets which suggest a round cross-section bumper? Firestone "Noskid" tires are also part of the picture.